In early years there was no electricity in the cabins of the waving pines, with only an outhouse at the end of the trail. Today camp has been updated and made very comfortable with all updated facilities, shower house, toilets, new beds, training hall with roof and AC in the dining area. Most things in your life change to make it easier, goals more attainable and everybody may enjoy contentment. All has changed except true Karate-do! 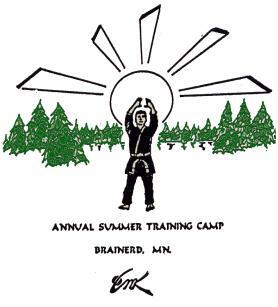 CMK camp will not yield its training to the placid. Expect to be challenged, expect to sweat, expect to access your power, and realize your past journeys on the Karate road of being. You will find nothing has changed, you have not changed - you are Karate-ka! Return to that part of your life that never knew surrender, the part part of your life that never said 'Enough'. Return to the thrill of your first connected Focus, the first poised kiai that would change you forever! I invite you to return to the 'Old'. If it is your first time at camp, you will find 50 acres of secluded lake shore, with a beautiful sugar sand beach to lounge in or play volleyball. Five canoes, five kayaks, as well as two paddle boats, and two docks in the lake (also used for special training...some risk of getting wet). The outdoor Dojo is approximately 50' x 75'. Smooth cement floor with a roof and lights for late night training, if the spirit moves you. The main dining hall is where all meals and meetings take place, and may be used as a Dojo in case of bad weather. There is one fully equipped VIP cabin usually reserved for the female staff and cooks. The other six cabins consist of single beds with mattresses. The community bathrooms and shower facilities center the cabins at trails end. There is miscellaneous recreation, such as basketball, shuffle disks, horse shoe, above mentioned water sports and again in 2014 are Trikkes! Most training is held in the outside Dojo, or on the beach, on the docks, occasional late night and sometimes in the water. You will learn a traditional kata called "Ca-noe-ryu", using canoe paddles. A video camera will record part of your experiences; some of it usually needs to be censored, as we don't want anyone to try it at home. Tennis shoes are a must. Bring two Gis if possible or a second set of apparel to train in. Water shoes or sandals are good. Some of the training you will not be wearing Gis. Bring something you can move in. The basic supplies are: shorts, tanks, sweatshirts, blue jeans, swimsuit, camera, fishing gear if you fish, lawn chair, flashlight, sunscreen, sunglasses, bug spray, personal hygiene stuff, sleeping bad or bed roll and pillow, towels, and don't forget your karate belt. There is plenty of food, but you are welcome to bring a cooler for your cabin to stay hydrated. So basically, bring whatever you want. Camp tuition includes: All training sessions, all meals, recreation and all camp facilities, plus 2014 Camp memorabilia. Pre-registration: Pay $50 down (non-refundable) by June 7, 2014. Send to the CMK Office.